Our Koi pond is 3 years old today! Be patient. Water quality, if you are going to have Koi in your pond, is critical. 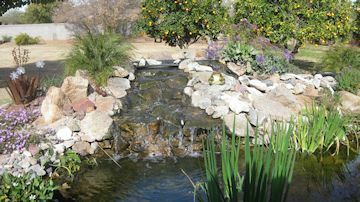 It takes a substantial amount of time for the biologic enzymes to plant themselves in your pond and filters and grow. I would wait probably about 6 months before introducing any fish into your pond. I learned the hard and expensive way. I freaked out when algae took over the pond and so, I added chemicals, lots of them. I created a toxic waste dump that killed fish continually. That set us back by about a year and a half. I kept adding fish and they kept dying. 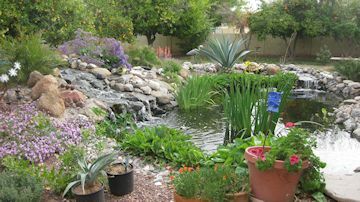 I have learned that there are ways of curing pond problems without the use of chemicals. I have not used any chemicals for the last year and a half. For instance, I now use barley to keep the algae from taking over. I put in about a dozen lilies and other pond vegetation to provide shade and to help oxygenate the water. Overbuild your filter system. The original filter system simply could not handle the volume of water in the pond. After trying various external DIY filter systems, many of which worked but were too small to handle the volume of water, we settled on a four barrel system using different media. This system does a really good job of keeping the water clear. 3. Choose your pond builder carefully. One contractor was recommended by a friend. To be safe we did get 5 bids. Some couldn’t build the kind of pond we envisioned and wanted to use a lot of concrete. Others wanted to add so many bells and whistles (that later we would discover were not necessary) that the cost was more than we could afford. The contractor we chose was the friend’s recommendation (not the highest bid and not the lowest bid) but we had to fix many of the problems he created. 4. The shade is your friend in hot climates. Last summer we built a DIY shade cover for the pond, 17’ X 31’. We put it up in June and took it down in October. We will put it up when the temperatures stay consistently around 95 to 100 degrees and the sun becomes brutal. It not only shaded the pond and kept the water temperature lower by as much as 8 to 10 degrees but it also kept our only predator, the heron, away. Little did I know that any heron existed in Arizona much less in our area until he came to visit and I noticed that we lost some fish. There seems to be only two ways to keep predators at bay. Put netting over the entire water surface area or in our case, put up a shade cover. Since we don’t have raccoons or bobcats – just the heron – the shade cover works for us. 5. Rain in the desert is a rarity and when it does come you must compensate for it. After rain storms I was losing fish and couldn’t figure out why. Then I learned what rain can do to a pond. The rain water can be acidic and can also deplete the oxygen levels. Test your water frequently so that you can establish base line levels of water quality. After a rain test again and treat the water naturally, as needed. We have also learned to add extra oxygen before a rain storm, during and after it. It’s another DIY project. We use a small, submersible pump, a short piece of hose and a spray nozzle. The extra water spray into the pond keeps the oxygen level steady.